these photos were taken during my lunch break, the only time i could enjoy some of this sunny weather today. we found this out of place piece of wall in the middle of a meadow in my favorite park. i guess it's part of the old city walls and you can tell it has all this history trapped between its bricks. it's been a while since i last pulled this romper out of the closet. i love that it has this nautical theme and my favorite are the buttons with cute little anchors on them. oh, how i wish i was out sailing somewhere instead of being stuck at work. but the weekend is so close and that's what keeps me going, plus it's a long weekend so that makes the waiting worth while. my first instinct was to pair this with some bright red tights but decided to go for some spotted ones instead. 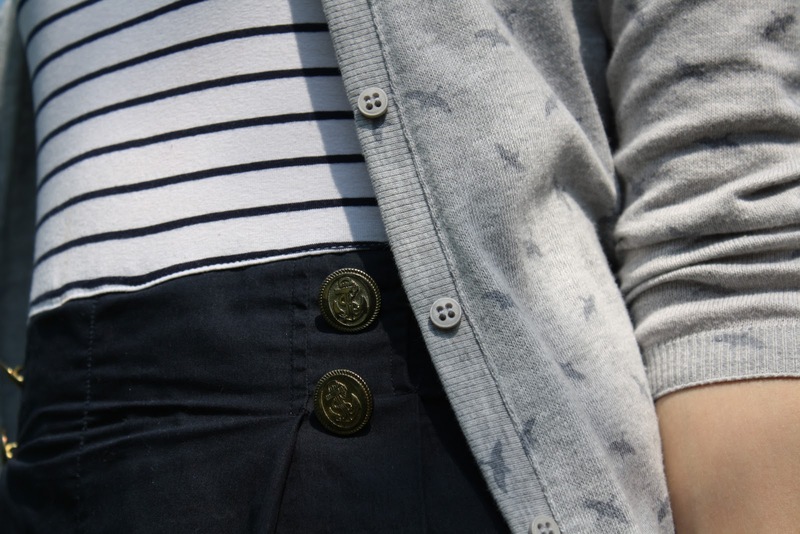 i then chose a cardigan with a bird print that i thought went well with the theme. really like your blog, I like your style and all your looks, you are charming! !